Merry Fisher Marlin models are characterised by an inverted windscreen and a walk-around deck plan. 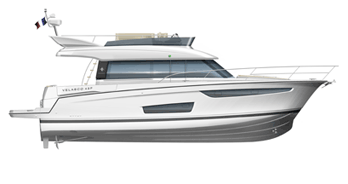 Safety, performance and featuring simplified handling are the watchwords of this line, with an deep side decks, a proven hull and an outboard engine. This line features an adventurous contemporary design. These powerboats are inspired by Scandinavian style and adapted to meet the needs of customers from around the world.